Before visiting Tiki themed bars in Los Angeles, and even at Disneyland, I admit I did not know much about Tiki cocktails outside of a traditional Mai Tai. 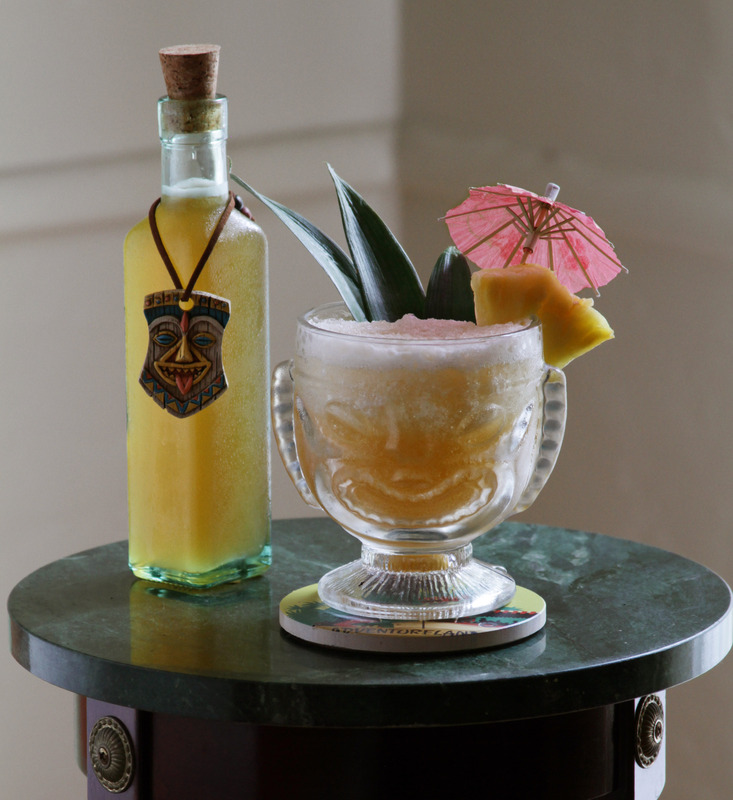 However, once I began to learn more about the great variety of Tiki drinks, I started looking into how I can re-create some at home. 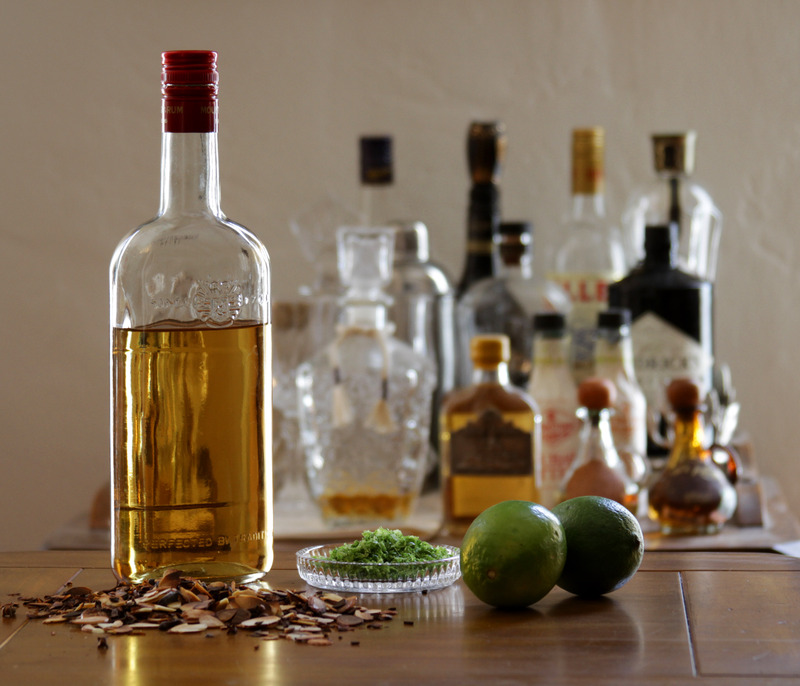 I found that most of the flavors I enjoyed were due to the addition of falernum, a liqueur rumored to come from Barbados that is intricate in flavor, yet incredibly simple to make. Although it can be found premade, falernum’s ingredients are straightforward and the process is easy enough that I decided to make my own batch at home. Ingredients: 1/3 cup sliced almonds (raw), 40 whole cloves, 3/4 cup rum, zest of 8 limes, juice of 3 limes, 1 1/2 cups of sugar, 3/4 cup warm water. Instructions: add the almonds and cloves to a pan and toast over medium heat until almonds are just slightly browned. Add the almonds, cloves, lime zest, and rum to a jar then cover and shake. Let the mixture sit for two full days (one day if you don’t want it to be too potent with clove flavor – I recommend two days for the full effect). After the two days, combine warm water and sugar in a container and mix until the sugar has dissolved. Combine the sugar water, rum mixture, and lime juice into one container and mix thoroughly. The falernum can be refrigerated for up to one month. This liqueur combined ingredients that I already had at home, and I’m excited to use it in a variety of delicious Tiki cocktails. Since our third date together at Barnsdall Park, we quickly realized how much we enjoy picnics. It’s so nice to pack a simple lunch and lounge in one of our favorite parks on lazy weekends. We’re lucky enough to have a great selection of parks in our neighborhood, and one of the most interesting has to be the La Brea Tar Pits. This little park is filled with shady trees, animal sculptures, and of course pools of bubbling tar – making it an incredibly unique and lovely park. The bubbling pits are behind fences, and as long as you avoid certain coned off areas, you’re not in any danger of getting your shoes stuck. Right next door to the tar pits is the Los Angeles County Museum of Art. The Pavilion for Japanese Art is an architectural masterpiece that forms the perfect transition between the two properties, with its rough stone texture and tusk-like structures on the roof. For the picnic menu we tend to stick with the three main categories: sandwiches, a type of salad, and fruits. On occasion, we pack a few extra snacks if we have them at home, but following these categories makes the prepping process fairly quick and easy. Aside from the food itself, I always pack enough beverages to keep us hydrated, a picnic blanket, and of course a good book. 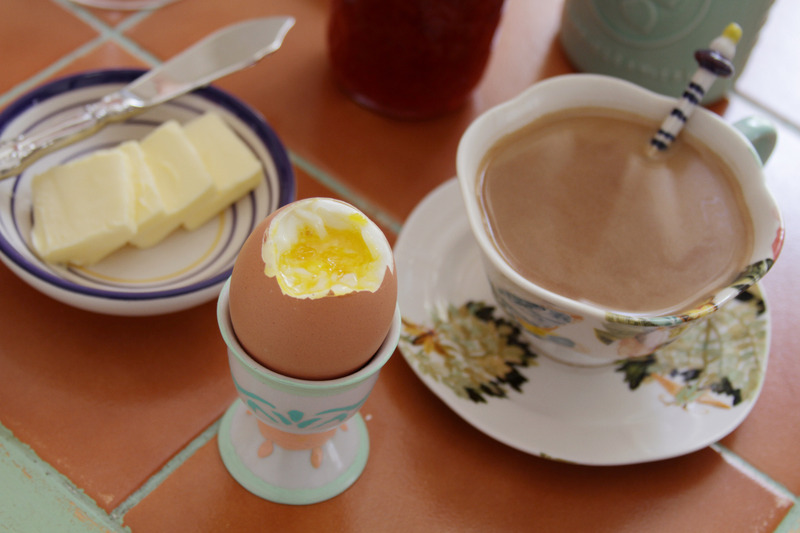 One of my favorite meals from our honeymoon was a simple, straightforward, soft boiled egg breakfast. 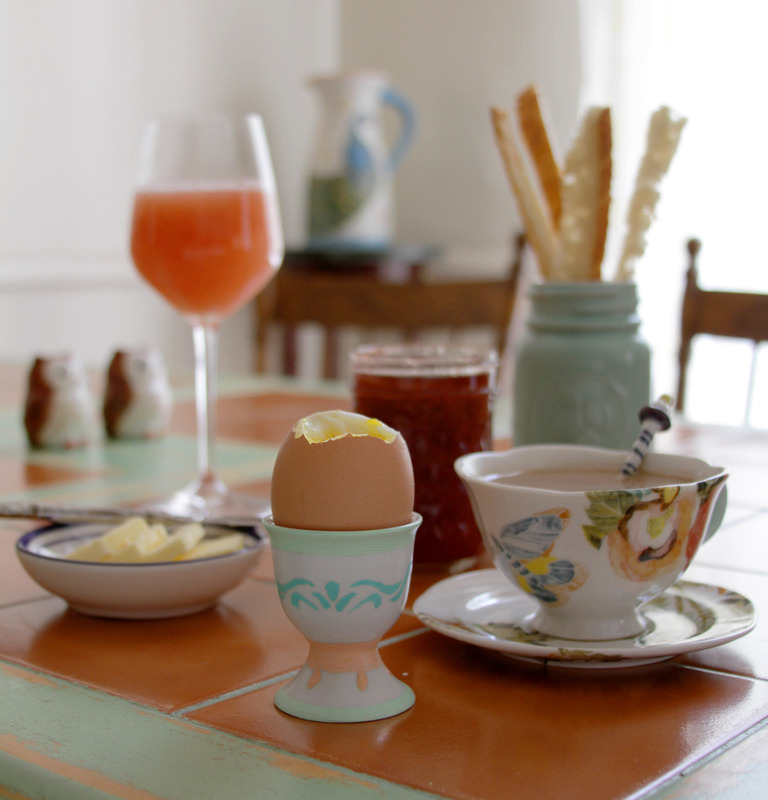 Although fairly minimal, the meal felt fanciful as we enjoyed it on a slow morning in Paris, and I instantly knew I would be recreating this meal at home. The main piece in this meal is a just a soft boiled egg. I boiled five cups of water, brought it back down to a simmer, then added four eggs to the water and set a timer for six minutes. After running the eggs under cold water immediately after cooking, I just sliced off the top of each egg and put them into egg cups. 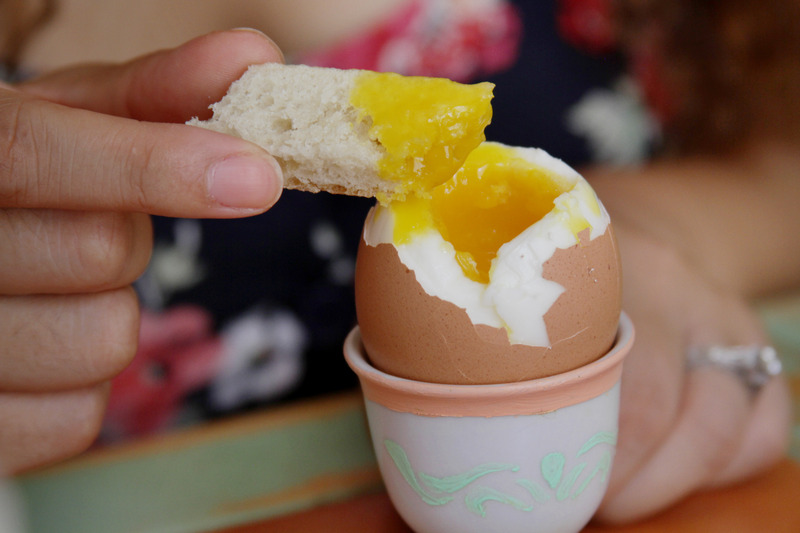 To scoop up the runny yolk inside the egg, I sliced up a few pieces of bread and lightly toasted them. To accompany the egg and bread, I set out a jar of delicious homemade jam and some butter. Just as we had experienced in Paris, I made coffee and squeezed a few grapefruits to make a fresh juice to complete the meal. This leisurely breakfast was just as satisfying and decadent as we remember, and it will certainly remain a staple in our home.